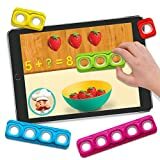 Kids today are really lucky, what with the wide selection of interactive learning toys that will let them learn while playing. One of these interactive learning toys that is getting a lot of praises and reaping awards is Tiggly Words, a new learning system for tablets and similar devices for kids ages 4 to 8. Tiggly Words is a set of five vowel toys that costs $29.99. At age 4, children are already long past learning their first words. Now it is time to enrich their vocabulary. However, given the short attention span that kids of this age usually have, parents usually find it an ordeal. Thus, they look for toys that can actually double as a teacher, helping them develop and improve their motor skills and spatial reasoning. That is where the Tiggly Words comes in. Even preschool teachers will find a lot of help from this interactive learning toy. Tiggly Words is composed of five vowel toys, but what makes it really unique and effective is the addition of 3 learning mobile apps. These apps are the Tiggly Doctor, Tiggly Submarine and Tiggly Tales. Each of these three apps introduces kids to different game environments, each with its own characters, scenarios and puzzles. It involves the child choosing any of the vowel toys and placing them on the screen of the tablet. It is at this point that we appreciate how sensitive the vowel toys are. That is thanks to how the manufacturers designed silicone touch points on the letters so the tablet would react accordingly. The construction of the vowels is worth touching on, because they are made to be very durable. Since they are for kids to play with, we’re glad to see that they used vivid colors to make it more appealing. We noticed how there were no hints or prompts that will help out the kids when they are stumped or stuck while playing the game. We would also like to see more gaming environments, preferably some with more action for the more active kids. Tiggly offers a one-year limited warranty on all its products. In case of defects, they also issue both refunds and exchanges, but only within 60 days from the date of purchase. Are The Tiggly Words Worth The Money? The combination of physical toys and mobile apps make this something that you should consider buying. The fact that it comes with a reasonable price tag makes it a must-buy, and an investment you will not regret making. Where Can I Buy The Tiggly Words? Check out Tiggly’s website if you want to purchase Tiggly Words directly from them. They have also partnered with various retailers as well as online marketplaces. Amazon is clearly one of the best of these online stores, and if you purchase Tiggly Words from them, you will also be able to save more, since you can get it with free shipping when your total order exceeds $35.00. Think of all the words that your child will learn while having fun just by using Tiggly Words! Handy Manny Toys on Sale! Toy Reviews 2015 is a participant in the Amazon Services LLC Associates Program, an affiliate advertising program designed to provide a means for sites to earn advertising fees by advertising and linking to Amazon.com. Toy Reviews 2015 Copyright © 2019. All rights reserved.